How Can You Tell the Difference Between a Function and its Derivative on a Graph? To see the difference between a function and its derivative on a graph we must return to our intuition of the derivative. The derivative is slope or rate of change. So, when the function is increasing, the derivative is positive. When the function is decreasing, the derivative is negative. And when the function has a maximum or minimum, or an inflection point, the derivative is zero. An inflection point is just a point where the curve changes its concavity. 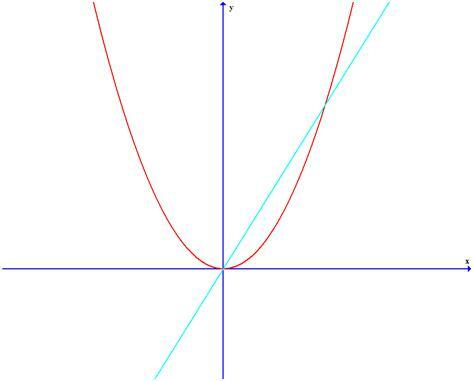 The graph of f(x) is in red and its derivative is in light blue. We can see that for x>0, f(x) is increasing and f'(x) is positive. For x<0, f(x) is decreasing and f'(x) is negative. For x=0, f(x) has a minimum and f'(x) is zero. Comments for How Can You Tell the Difference Between a Function and its Derivative on a Graph? Join in and write your own page! It's easy to do. How? Simply click here to return to Your Questions About Derivatives.